Summer in Delaware is about indulging the senses. Feel the sand. See the sunrise. Smell the saltwater. Hear the waves crashing. Taste… some of the best cocktails you’ll find anywhere. These drinks are so popular in Delaware at summer time that no vacation is complete without trying at least one. Orange Crush – This is it. No drink says summer in Delaware better than the Orange Crush. The Starboard in Dewey Beach is the place to get one. If you’re in Bethany Beach, try Mango’s. And if you’re trying to keep your bikini bod, make yours “skinny” by trading out lemon-lime soda for seltzer. Dewey Devil – This drink is a staple at some of the Delaware Beaches’ most popular nightspots, like Northbeach. The frozen mixture includes ingredients like strawberries and cream. And it is best sipped slowly to avoid brain freeze. Beach Bucket – A bucket of drinks usually involves bottles of beer, but not at Big Chill Beach Club at Delaware Seashore State Park. This beach hot spot serves up four delicious, rum-based concoctions in a 32 oz Beach Bucket. Enjoy one by yourself, or share, as you watch the sun set over the Indian River Inlet Bridge. Swamp Water – Normally swamp water isn’t the kind of thing you’d want to drink. But at Boondocks near Smyrna, it’s a must-try. 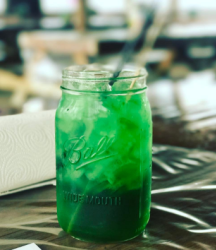 Served in a mason jar and colored a distinct shade of green, this beverage is a perfect complement to the restaurant’s famous crab. Original Agave – A Delaware favorite is back and better than ever. Regulars at Agave in Lewes know to start any evening off with the Original Agave margarita. And if you are feeling particularly adventurous, make your second drink the Sweet Heat, which has muddled jalapenos. 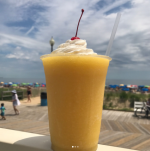 Vin-O-Slush – Combine the crisp wine of a Delaware Beer, Wine & Spirits mainstay, Salted Vines (formerly Fenwick Wine Cellars) with the feeling of drinking a Slurpee from 7-11, and you have the Vin-O-Slush. Of course you can try red and white, but blue, yes blue, could also be right up your alley. Dogfish Head Lupu-Luau – Think of a beverage that is synonymous with Delaware and a fruit synonymous with summer. It’s quite possible you came up with Dogfish Head beer and coconut, which means you were really thinking of Lupu-Luau. Available only during the summer months, this IPA includes coconut in three ways – toasted coconut, dehydrated coconut water and a hop variety with a coconut aroma.